University of Washington faculty and staff have access to CEB IT Leadership Council, which includes insights, tools, and actionable solutions. UW’s CEB IT membership offers benchmarks, proven best practices and executive networking to address emerging business challenges. To register, go to https://www.cebglobal.com/member/it-midsized/. Fill out the fields under the “First Time User” heading using your UW email address. After hitting submit, an automatically generated email will be sent to you with your new temporary password. Click on the link in the email to activate your account and set your new password. Your username is your UW email address..
Gartner research resources are available to current University of Washington faculty, students, and staff. 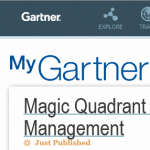 To access Gartner research resources, use your UW NetID to log in at gartner.uw.edu. If you are sent a direct link to a Gartner article, you will have to login at gartner.uw.edu before you can access the link. Technology professionals at the University of Washington have access to more Gartner resources, unlimited analyst dialogues and architecture document reviews, as well as technology consulting. 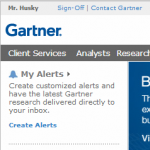 If you are a technology professional, and you have logged in at gartner.uw.edu, but you see the white screen shown above rather than the blue screen shown to the left, please request access to GTP. Under a contract agreement with Gartner, information technology employees at the UW are given access to this service. This service is not available to faculty or students under this agreement. UW-IT provides access to research resources from the Educational Advisory Board (EAB) IT Forum at no cost for UW students, faculty and staff. IT Forum offers a wealth of information technology and information management content. Topic areas include data governance, analytics, student success, and general measures and metrics, available through online articles, webinars and in-person consultation. The EAB has more than 650 researchers, consultants and technologists serving over 1,000 colleges and universities across North America. View the UW-IT video to learn more and get started. Offering a variety of services to help you protect the confidentiality and integrity of UW information while making it available for appropriate use. The PASS Council promotes a collaborative approach to information security and privacy at the UW. Accessible Technology at the UW – Information on acquiring, building, and configuring technology so that it works for everyone, including people with disabilities. Purpose: This list is intended primarily for computing support staff and others who support central UW services who are interested in receiving email notifications about widespread UW Information Technology computing or networking outages. To Join: Go to the eOutage sign-up page. Purpose: Provides a means of informal communication and support for distributed computing support personnel at the UW. To Join: Go to the Web page. Purpose: Provides a means of informal communication and support for distributed computing support personnel at the UW working with Linux. Purpose: An email list covering Red Hat Enterprise Linux for UW tech support people. The goal is to segment RHEL-specific tips or questions (up2date, rpm, kickstart, java interaction, etc.) from the linux@u list and to have more UW-specific information (satellite server, custom channels, etc.) than the @redhat.com lists.